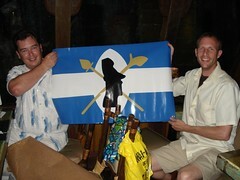 The FOM flags return to South Florida just in time for the 2007 Hukilau. Here it is being unrolled in the Molokai bar inside of the "Mighty Mai-Kai." That would be me on the left and Capt'n Skully on the right.